Fenix recommends using excellent quality batterirs. If the light will not be used for an extended period, remove the battery, or the light could be damaged by electrolyte leakage or battery explosion. 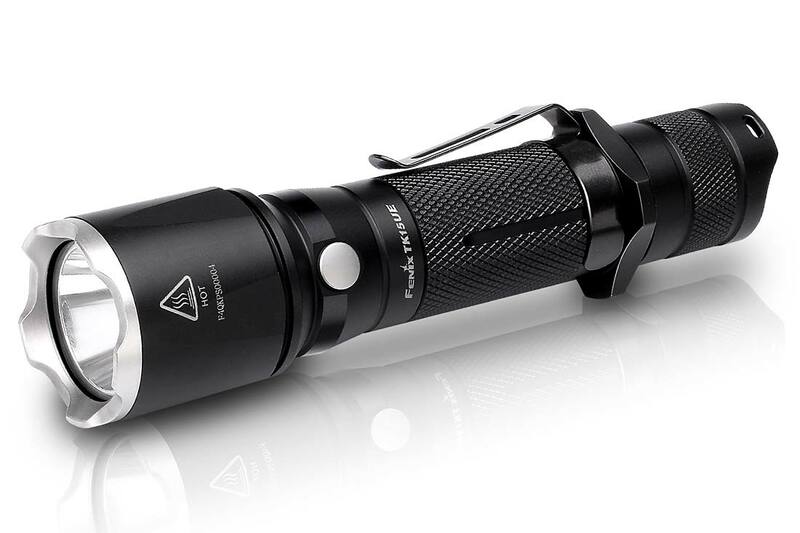 This is my fourth Fenix flashlight oh, very well made rugged and dependable. I have had a TK15 for about 8 years, and I have not been nice to it. I have dropped it off 15 ft ladders, used it in rain, dropped it in buckets full of oil or fuel more times than I care to admit, taken it in the ocean, used it as a hammer, and a lot more. Through all of that this thing just keeps on chugging like it was new. My only complaint is that it is so reliable that I want to upgrade, but there is no point since it is so good that nothing is wrong with it except some cosmetic scratches. For work I have used a lot of other brands and nothing has lasted nearly as long or been nearly as good as this thing. Any time someone asks about recommendations for a light for work or tactical stuff I always tell them to check this thing out, and not even bother looking anywhere else. It is that good. I bough both lights as gifts. Great flashlight! Bright and compact, I love it! The TK15UE is an awesome flashlight. I had a hard time deciding whether to mount it on a rifle or keeping it as my edc light. I’ve used it for working at night and was very impressed. Fantastic light should have purchased it before now. When you need a no-nonsense light that WILL get the job done, this is your light! I hike patrol with this light, and I trust my life with it. Using this with a headlamp creates a formidable wall of light. If I’m looking for something in those woods, I’ll find it. 100-200 meters out this light comes to life. 300+ meters I’m still able to “paint” light over something. Been using this torch a little over a month now. I purchased a couple usb rechargeable batteries with the light. I have to say I love this flashlight. The various outputs make this an all around winner. It is very versatile. I can use it up close to read something and then go into turbo mode to see across the yard. I use it every night to check for skunks in the yard before I let the dogs out. Love the rechargeable batteries…beats using CR 123A’s. I recommend this light. I always searched of the highest output I could find. After experience with a few “high output” flashlights I realized that the function of the switches is much more important. For instance my last light had to cycle through several modes with a single switch before returning to the original setting. The Fenix TK15UE with the side switch for function modes and the tail switch with memory taught a great lesson. Use the memory to turn on to where you would most likely need it then go to the mode you perhaps need in a given situation: turbo, strobe or low light. This flashlight is intuitive and that makes a ton of difference for me. Brightness? It has all I could want. I can now distinctly see the difference between a hunting dog and a coyote at 75 yards. I originally bought this light via Amazon in 2010 when it was just the TK15 (no UE). I have used it in pretty terrible conditions over the last 6 years and didn’t have a problem. I noticed that when I used less than stellar rechargeable batteries the charge would only last about one 8 hour shift. I discovered only about six months ago that Fenix had their own rechargeables. I switched to their 3500mAh batteries and I go a week with the same battery and never worry about it dying. After all the abuse my light took, it finally died on me for good about two weeks ago. I contacted Fenix customer service and they asked me to send it in. Today I received a brand new light in the mail. I cannot say enough how much I think of this company to send me a new light after all the years and hours of run time on my old light. No questions asked. I sent it, they sent a new one. I legitimately like this light. I am currently in the market for an additional light and think I will try the TK16. I like the set up on my TK15. I pretty much keep it on the high setting. I have used strobe but rarely as the location of the mode switch on the TK15 makes it a little difficult to change modes while running or on the fly. That’s the main reason I leave it on the high output setting. On my original I didn’t have any issues with failure to turn on or anything until it finally took one too many blows. I cannot recommend not only this light but this company. I’ve seen some bad reviews on a couple different products from people that say they didn’t receive assistance but I find that hard to believe as I was emailed back by customer service immediately. Seriously love this light and this company. Cameron, Thank you for your comment! We are so glad you love Fenix Flashlights and see that our customer service does everything they can to help! This light is so awesome, it crushes the others and I’m so glad I decided to buy it. I’m a truck driver and I use it everyday. I’m at work by 2 am and in the dark to hook up and inspect tractor and trailer every morning. The other guys are still using the cheap aa battery lights and are always talking about how bright mine is. It’s so fun to come over to them and shine my light to help them get ready. The price might seem high but don’t worry because this thing will last forever and it’s rechargeable batteries will pay for its self in no time. It’s also a blast while we were on vacation at the beach. We would take the grandkids out at night looking for crabs and this light blows everyones cheap led flashlights away. The kids even notice how much brighter this Fenix light is. I’ve had mine over a year and it’s still going strong on the first set of batteries. I usually charge each of the batteries once every other week. I have 2 so I always have a charged battery ready to go in case I need it. Bottom line: this light will possibly be the best light you ever own. You will not be disappointed, so tell the wife this is a safety investment and just get it.